Curly in the City: Flash, Bang, Boom...there you are done! Flash, Bang, Boom...there you are done! So Mama needs to do some shopping, I have been a very good girl for quite some time now (If you don't count the Jeffery Campbell Tick Wedges, or those other B.M pair, which I think I neglected to introduce to you guys. They are insane, and I am in love, can't wait for the sidewalks to dry up a bit so I can sport those bad boys! )....I just have the itch and it needs some *ahem* retail therapy to cure it! 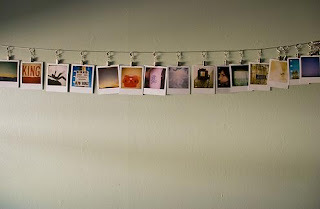 I am currently lusting over the notion of getting a Polaroid camera. And then before you know it and wham -now I feel that I NEED it! I don't really need it since I have one of these - which is simply amazing! But the nostalgia and fun it would be to own one just seems to good to be true! They instantly bring me back to my childhood. 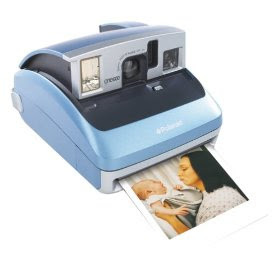 My grandma used to have one - she would let me snap a million pictures of whatever I want, I wish I had those images now! I want to hang some like this in the house! Maybe the perfect solution for the blank spot over the new bed! Has anyone done this? Do you have one?! Am I silly for needing a Polaroid Camera? I think it is totally justifyable and a necessity!